The grave site of Susan B. Anthony at Mt. Hope Cemetery, in October 2016. There are just a few days until Election Day and I have to confess that I’m conflicted about what I’m going to do when I get to the ballot box. I’ve been supporting a third party candidate the entire season, but I’m also aware that this could be an historic election. Do I want to use my vote to help put the first woman in the Oval Office? So I’m asking myself: What would Susan B. Anthony do? As I’m working on my book about people buried at Mt. Hope Cemetery, I’ve been putting off writing about the famous abolitionist and suffragette. It’s a big story and I’m not sure how to pare it down, how to decide what angle I want to focus on. I’ve decided that I’m going to visit her grave on Election Day, and start the story there. This year, public gatherings are already in the works for Tuesday as groups of people plan to trek to the Anthony grave site and pay their respects to the woman who fought tirelessly for women’s rights. I suspect that a lot of women will be celebrating the opportunity to vote for the candidate who may actually become the first female President of the United States. And here’s where I’m conflicted. The rational part of me wants to vote for the candidate who best represents my views, and that’s not Hillary Clinton. I appreciate and respect her as an accomplished woman, but politically, we’re just not on the same page. Bandit and I, out for a walk at Mt. Hope. Out for a walk this week, Bandit came upon a groundhog hole. Not unusual; the cemetery is a National Wildlife Federation “Certified Wildlife Habitat” and is crawling with squirrels, chipmunks, groundhogs, deer, and foxes. What was unusual? Around the entrance to the hole were items the groundhog had hauled to the surface while burrowing underground. Bandit found a groundhog hole with some interesting stuff in the dirt around it. Stuff Mr. Groundhog hauled up from under the ground. Out for another walk on a different day and in a different section of the cemetery, this time sans dog, I came across yet another groundhog hole, and lying right there in the open was more casket hardware. I’ve been thinking about the groundhogs ever since. What do they do underground? How far underground do they venture from the hole? What do they do with items that are in their way? I’m assuming that over time they’ve hauled a lot of items to the surface and discarded them in dirt piles. Is it unusual to find stuff like this? I’ve been tracking the groundhogs, so I’ll keep you posted. UPDATE: Here’s a post I wrote for Patheos about my groundhog adventures. 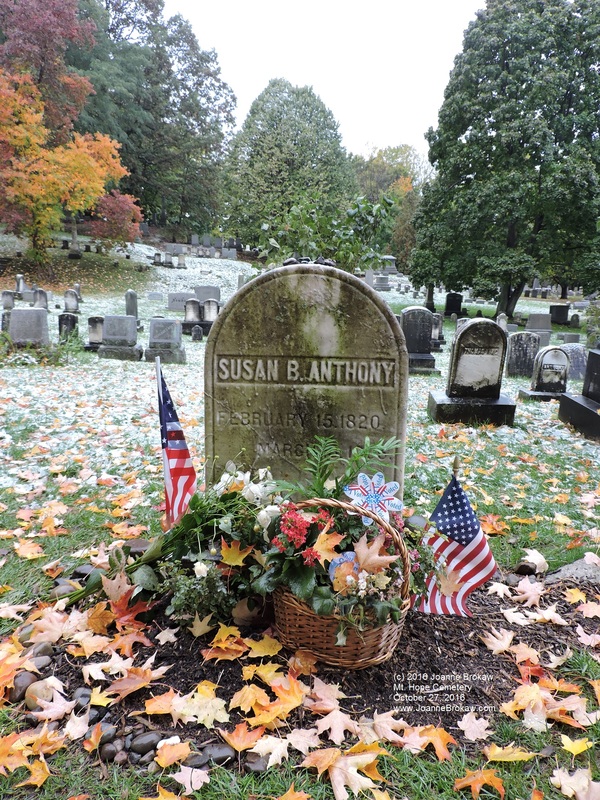 Susan B. Anthony’s grave, a popular place to visit on election day. It’s primary day in New York. Honor suffragists like Susan B. Anthony, who fought for the passage of the 19th amendment, and vote. Vote your conscience, vote your heart, vote your morals and beliefs. But make sure you vote. Thank you, lady with the alligator purse. This photo was taken at Mt. Hope Cemetery. Susan B. Anthony’s grave is located in Section C, Lot 93. 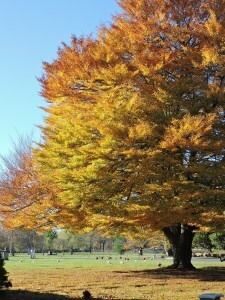 The colors are still brilliant on this beautiful November morning as we walked in the cemetery. 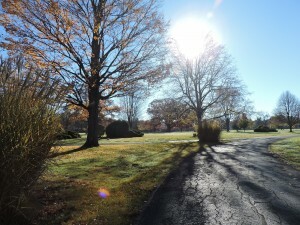 Walking the dogs this morning, I was musing over the life and death of a cemetery. I walk in several cemeteries, from historic Mt. Hope Cemetery in Rochester, NY, with its hills and dales, forests and lawns, prominent residents, and myriad headstones and monuments, to a small rural cemetery in Pittsford, NY, much smaller but no less interesting. 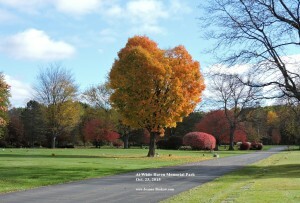 But the cemetery where I walk most often is White Haven Memorial Park. It’s close to my house, and because it’s a lawn park layout – open spaces and no headstones, only flat markers in the ground – it’s the perfect place to work with my dog Bailey, who has struggled with reactivity issues. We can walk here with few distractions, and the maintenance workers are patient as I’ve worked to counter-condition the dog to the sound of their work carts and machines. Plus, the chipmunk and squirrel population is far smaller here than in the more forest-like cemeteries. So while I love meandering in the older, more historic or unusual cemeteries, and do so when I have hours to kill, when we just need to stretch our legs, the dogs and I head to White Haven. And on a walk today, it struck me how the circle of life is played out in a cemetery. 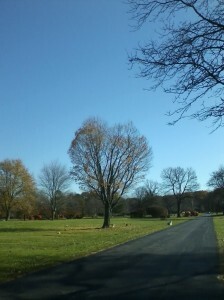 It’s a gorgeous day here in Western NY, early November and temperatures in the 70s. But even with the sun shining bright in the sky, it’s clear life itself is winding down for a season. The trees are reluctant to shed their leaves. 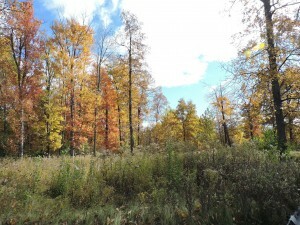 The trees, so green and lush in the summer, began changing colors a few weeks ago, brilliant colors that were almost too beautiful to look at. 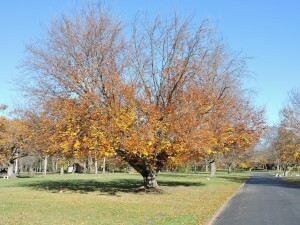 Now, they’re in varying stages of undress, reluctantly shedding their leaves as winter approaches. At White Haven, there’s a tree I call the Heart Tree. A week or so ago, it was alive with color. Today, it stands naked. White Haven is also an Audubon Nature Habitat. In the back part of the cemetery area has unmowed fields and a forest with walking trails. There’s a natural burial area where cremated remains are buried with wildflower seeds, the dead bringing forth life in every spring. 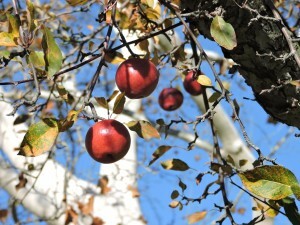 Throughout the main part of the cemetery, deer often roam the manicured acres, likely lured by the fruit trees that have dropped piles of cherries and are now laden with apples. At other cemeteries where we walk, squirrels and chipmunks are also rampant, scurrying around the headstones and up the trees with nuts and other nourishment to carry them through the winter. This morning, birds sing the song of fall as we walked, and kept a watchful eye over the mourners who sat in solitary lawn chairs under the bright morning sun, the dew glistening on the graves of those slumbering beneath. In a few weeks, all will be barren as winter sets in, ushering in a time for rest and reflection. In the spring, the cycle will begin again. Eggs will hatch and birds will fledge, trees will bud and flowers bloom, and new life once again emerge from winter’s night, guided by the spirits of those have gone before.